CAAAV is a pan-Asian group in NYC whose primary strategy for building power towards social change is community organizing. 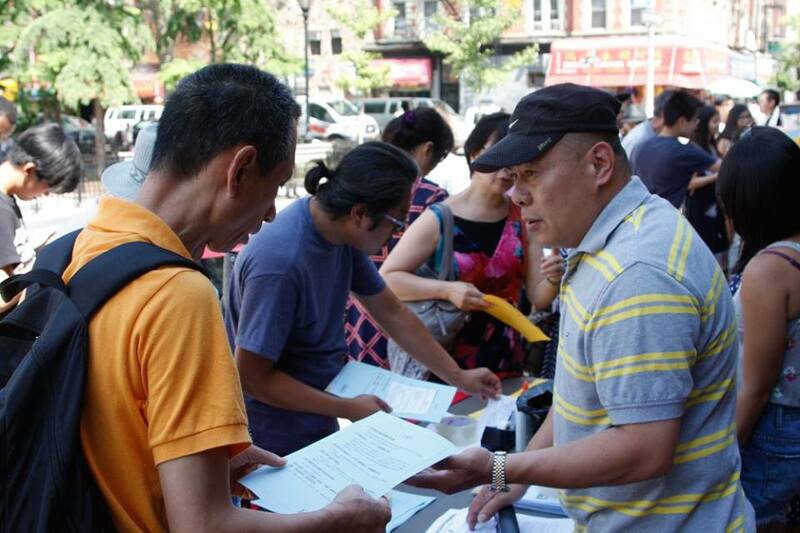 Tenant leader Mr. Chen inviting Chinatown residents to join us and get organized. CAAAV utilizes street outreach, door knocking, and regular new member meetings to build the base of community members involved in its campaigns. Basebuilding activities are tailored to the specific communities and campaigns are working on. CAAAV is led by its membership–Asian immigrants and refugees. Therefore, a central component of our approach is developing members to make leadership decisions, influence key stakeholders, and ally themselves with coalition partners. All of CAAAV’s major campaigns take place within the context of a broader network of organizations working in support of the issue. Alliance work may include groups that bring different strengths and abilities to the table (e.g. organizing vs. research vs. community planning vs. design & marketing) or groups that represent different community-based constituencies working to influence policy regionally and/or nationally. From fundraising, coordinating volunteers, to database management, this is often the most invisible part of organizing work, yet crucial for successful organizing. Be a crucial part of our organizational development and DONATE TODAY. CAAAV’s successful organizing is possible through your support.